Jeremy Lin is a sign of contradiction. This is not because he is a professional basketball player with an Asian heritage, a seeming oxymoron. (I should know: I am Chinese, I play basketball and I cannot jump.) He can jump and dunk over both you and me. He has enough game to be the first player in the history of the National Basketball Association (NBA) to average at least 20 points and 7 assists in his first five games as a starter. This is not because of his fairytale storyline, either. Undrafted and subsequently cut by two NBA teams, he somehow catapulted into stardom on a New York-based sports team through a series of circumstantial events. He is a sign of contradiction because he spectacularly defies the stereotype of professional sports athletes. He seems to be unfazed by the sudden Linsanity craze; instead, he would humbly defer to his teammates and the collective team effort after each win. This is after he out-duelled one of the best point guards alive in Deron Williams, outscored the future Hall-of-Famer Kobe Bryant in Madison Square Garden, and won a game on the road by hitting a last-second 3 pointer. In short, he has probably won a spelling-bee contest before: he knows full well that there is no “I” in “team”. Nor does he take his opportunities for granted. Many times he has spoken of his gratitude towards all that has been given to him. This is not surprising, as he is known to be a devout Christian. He doesn't need to do “the Tebow” to proclaim to the world that Jesus Christ is his Lord and Saviour, nor does he need to wear a Cross decked out with precious stones. 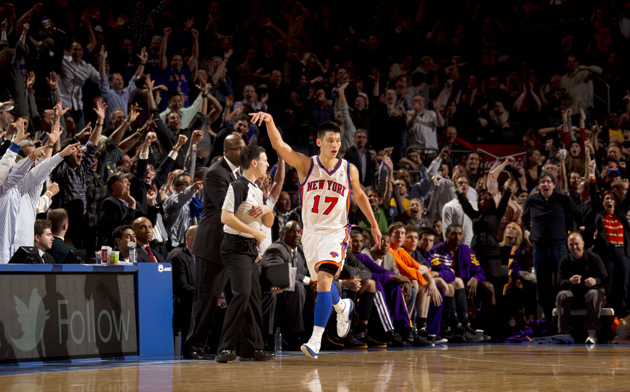 One knows that Linsanity is a Christian by who he is. Indeed, there is something good and wholesome about this young man; yet such is considered a sign of contradiction nowadays. A Scriptural example of such a sign is John the Baptist. He is the voice of conscience that tells others to repent, for the Kingdom of God is near. He even reprimands King Herod to his face about the latter's committing of adultery. Herod is greatly perplexed when listening to John, but he nonetheless liked listening to him (Mark 6:20). When a ray of light breaks through into the darkness, one cannot help but to be captivated by it. This is not unlike our general sentiment towards Linsanity: Cinderella stories are nice, but it seems to me that we naturally and subconsciously gravitate towards examples that edify and radiate goodness, albeit only hints of it. 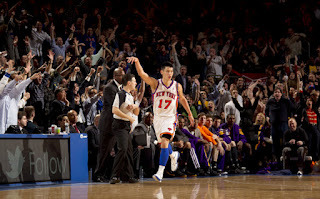 I am not suggesting that Jeremy Lin is the perfect Christian. He is most probably a sinner just like us. Similarly, his basketball skills need some serious improvement. His outside shots remain inconsistent; he averages so many turnovers per game that he can start his own DeLincious Bakery pastry business, and only time will tell how he handles personalized defensive schemes that are specifically geared towards stopping his penetration into the paint. Yet perfection is not the issue here; goodness is. Some would like to think that the moral behind Linsanity is to work hard and shoot for the stars in the land of freedom and opportunity, but I digress. Many have followed a similar path, only to forget or abandon their roots when they reach the top. What makes Jeremy Lin stand head and shoulders above others is that despite the success and glamour, he remains true to what grounds him as a person: Jesus Christ. God does not ask us to be successful; God asks us to be faithful – a faithful sign of contradiction.